MONROVIA – The government of Rwanda recently took a bold step in banning skin bleaching products. That country’s government described it as “unhealthy.” According to reports from Rwanda, the action was taken in November 2018 after the President, Mr. Paul Kagame, out-rightly condemned the use of the products. He urged the Rwandan Ministry of Health to take actions. There are also reports that the police force is currently patrolling markets in provinces across the nation and seizing skin-lightening and bleaching products from vendors. While Rwanda has taken this bold step, Liberia is doing the opposite. This West African nation is allowing vendors to erect huge billboards advertising bleaching products in and around Monrovia. One of such products being advertised is Clinic Clear. 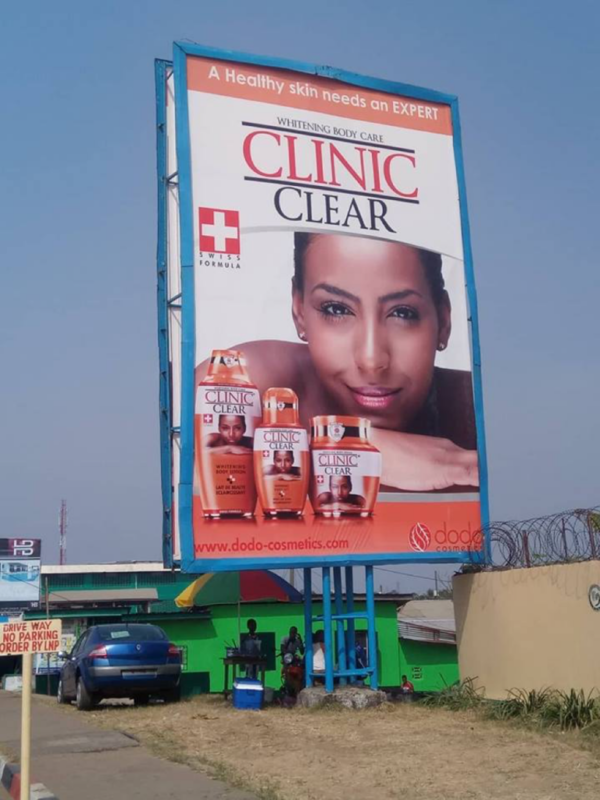 The advertisement is scripted with promotional messages: “A healthy skin needs an expert.” This product, which is said to be produced in Togo, has taken over many cosmetics stores in the country and is sold alongside other skin lighting creams including B.B. Clear, Caro-tone, Bronz-tone, White Secret, Golden Glow and Bio Clear. Pretending to be a wholesaler, our reporter, who visited one of the stores downtown Monrovia, noticed various types of bleaching products on exhibition on the shelves, with the prices written below each item. A big bottle of Clinic Clear, was being sold at L$800 and the medium size bottle was sold at L$500, while the small bottle and its liquid soap were sold at L$350. Another product called B.B. Clear was sold at L$1060, medium size sold at L$800 while the small bottle was being sold at L$500. “Girls can really buy Clinic Clear and B.B. Clear. Those two products cannot stay long on the shelves. Sister, if you want to sell and make your money, buy Clinic Clear, BB Clear, Bronz Clear and Caro-tone,” the vender said. It is said by most of the women using these skin lighting products, that they (products) beautify their skins and make them appear attractive. One of such persons a street vender, Bendu Sackie, not her real name. The first thing on observing Bendu, one would notice that her hands and feet are black and light complexion, while her face is light and her cheeks are dark purple. When FPA approached Bendu to buy an item, and asked if what she sold was responsible for her face color, she became ashamed to speak at first, but after few jokes to make her relax, she opened up. “I used to admire one of my friends’ skin color so when I asked her what kind of cream she was using, she told me it was Bio Clear. So I went to the store and bought my own to start using so that my skin could be fine too. But I do not know why it is making my face to look like this,” said Bendu. She is one of many young women and girls, who started bleaching because of peer or social pressure. Another lady, Theresa Blamo, said bleaching comes about when a lady feels neglected in a community due to her dark skin. She narrated her personal experience as a refugee in Côte d’Ivoire. According to her, when she and other ladies arrived in neighboring Côte d’Ivoire as refugees, the Ivorian men chose all the light skin women and left them who were dark skin. “For this reason, many of the other girls went and bought skin lightening creams and started bleaching so that they could be chosen later. I was not carried away by that. I maintained my dark skin which I still have today,” said Blamo. What Bendu and others, who bleach do not know is that medical personnel have said skin bleaching is dangerous to the health and could cause skin cancer. “The bleaching cream that contains the chemical hydroquinone is dangerous to the skin because it kills the skin pigmentation called melanin and does not allow the skin to regenerate. Continuous usage of this chemical affects the liver and other internal organs in the body,” said Jacob Payne, a Pharmacist at the Ministry of Health. Pharmacist Payne stated that by an entire country banning skin lightening or bleaching creams, shows that they pose serious health risks and are dangerous.